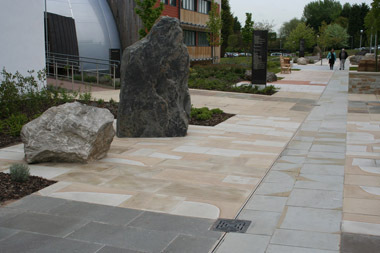 Landscape Architect: Munro + Whitten Contractor: Kier Construction We have been working for more than two years to facilitate the creation of the ‘Geological Walk’ at the British Geological Survey’s HQ. The British stone industry has come together in a remarkable way to support this project which shows every type of British paving stone in regular production and a good few that are not, but could be. The geological element itself, with materials representative of every period from the Precambrian to the Quaternary, covers 1200m2 and includes some 40 different products. 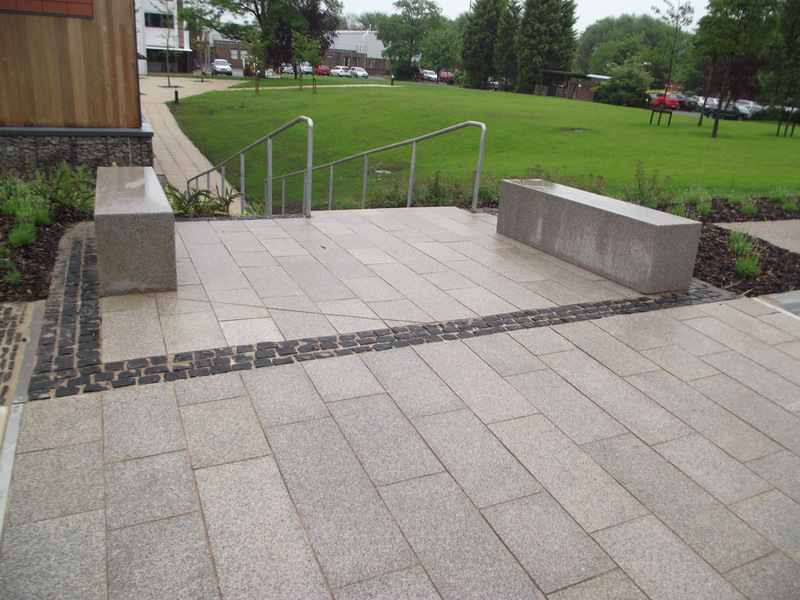 The stunning entrance approach covers an additional 600m2 and features Cumbrian and Welsh slate. 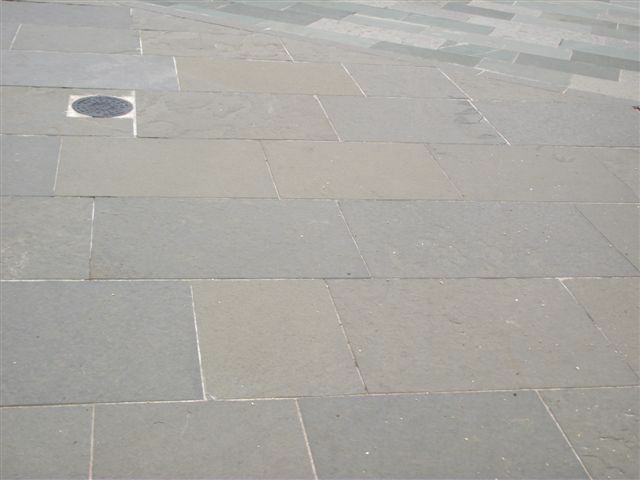 Whilst fulfilling the geological requirement to provide UK sourced paving of an appropriate age for each geological period, it has been possible at the same time to showcase every type of paving currently in production (as of 2011/12). Indeed, this was the starting point for selecting the materials for the path. Then there were the ‘gaps’ to fill in the geological sequence. 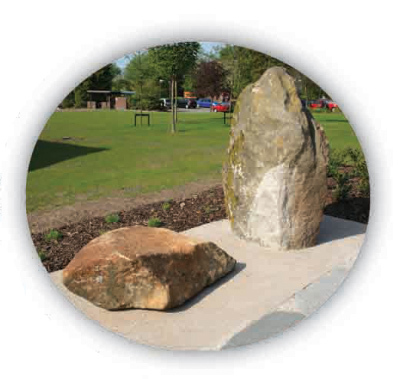 Some were provided using materials no longer produced but found as reclaimed material - Aberdeen and Peterhead granite setts from north-east Scotland and ‘ironstone’ setts from the M25 corridor in Surrey. 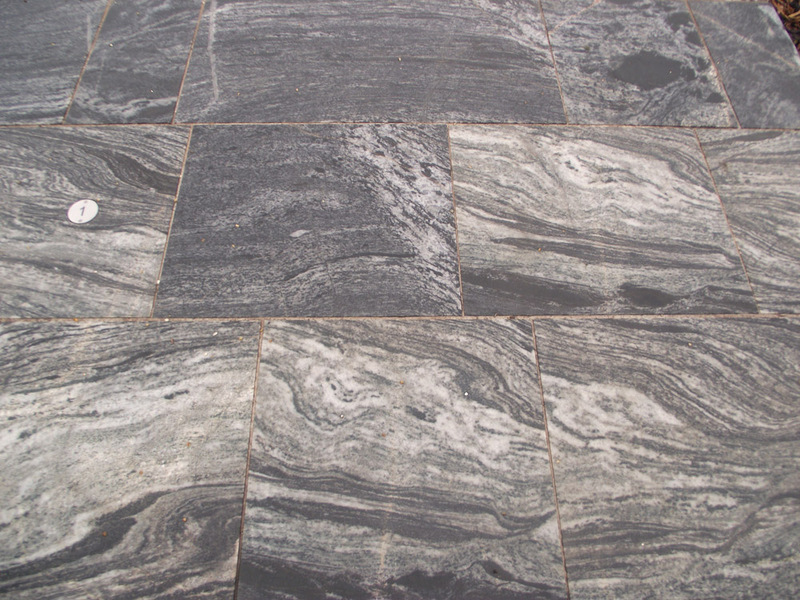 Knapped flints are still available, but to achieve the flattest possible face, and thus the safest paving surface, the examples seen in the Geological Walk were carefully selected and fashioned from cliff fall debris in a now-closed quarry. After these selections had been made, there remained two periods with no current production - the most recent and current period, the Quaternary, and also the Precambrian. In the case of the Quaternary, there are essentially no fully consolidated sedimentary rocks which lend themselves to paving purposes and there has been no recent igneous activity in the British Isles. 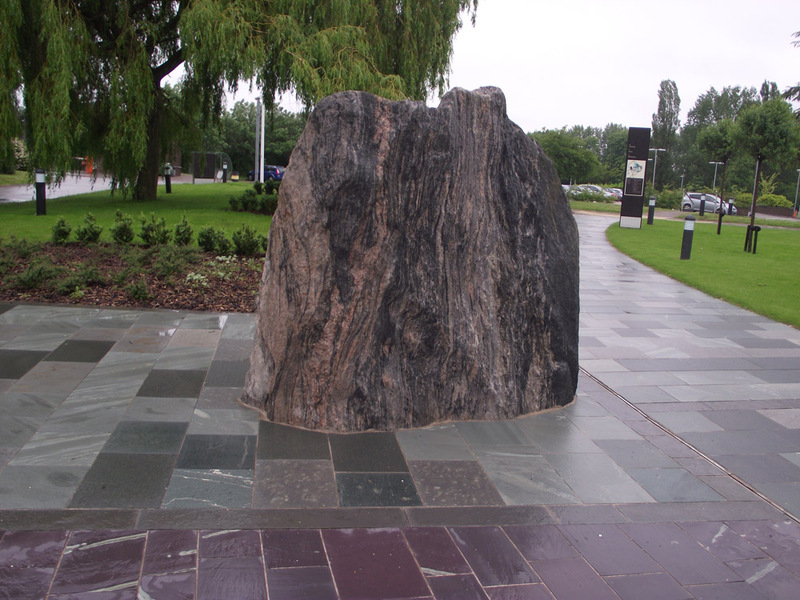 However, glacial activity widely affected the UK during this period and thus the deposits of the various glacial episodes - in the form of boulders - have been used. These were sliced to retain and highlight their external shape. The spaces between the boulder slices were infilled with Scottish beach pebbles, which have achieved their exceptional roundness through reworking by the sea since the last glaciation. 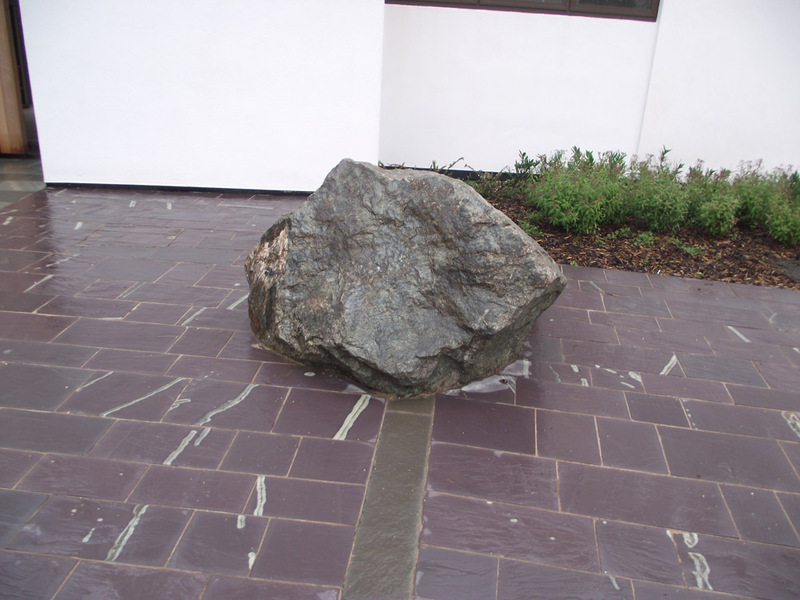 Although there are extensive areas of Precambrian rocks in the UK, it happens that none are worked for dimension/paving stone. There are quarries producing crushed aggregates but the fractures produced in the stone during blasting preclude the efficient use of the material as a dimension/paving stone. Precambrian rock has locally been blasted for other reasons, however, typically for the production of rock armour or the creation of dock facilities. In these cases, the intensity of blasting has been significantly less, so by careful selection from the residual material it has proved possible to create enough useable paving. Owing to their aesthetic qualities, a few of these materials could potentially be exploited for dimension stone on a small-scale if planning approval can be obtained. 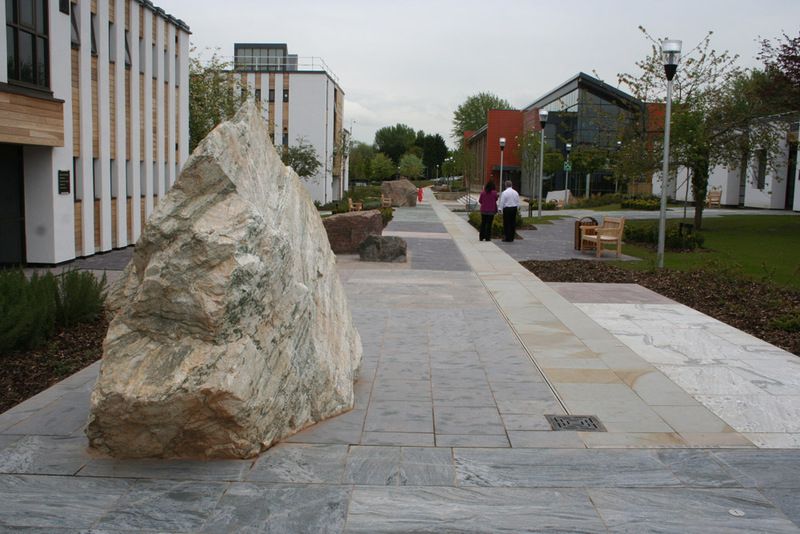 The Cambrian quartzite included in the Geological Walk was not in the original selection, but when some suitable residual blocks were discovered in a small roadside quarry, the opportunity was taken to include this geologically important stone type. The geology of the British Isles is quite remarkably varied for such a relatively small area of land, with virtually all types of sedimentary, igneous and metamorphic rock being present. We are indeed fortunate to have such variety and, evidenced by the display provided by this path, we should look towards making better use of this geology for paving.
. 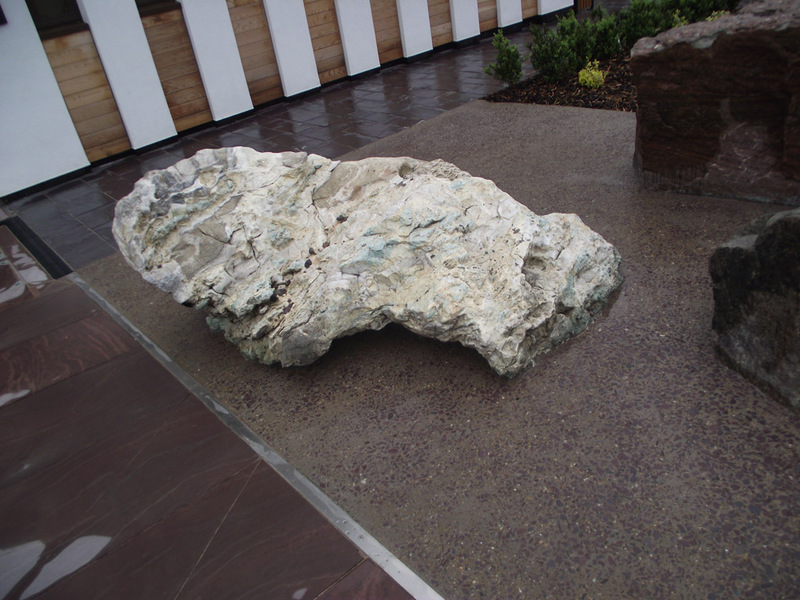 Particularly with porous sandstones, algae can take hold if the surface receives little use, adding a dangerous sheen to the sawn stone in a garden unless it is regularly cleaned. 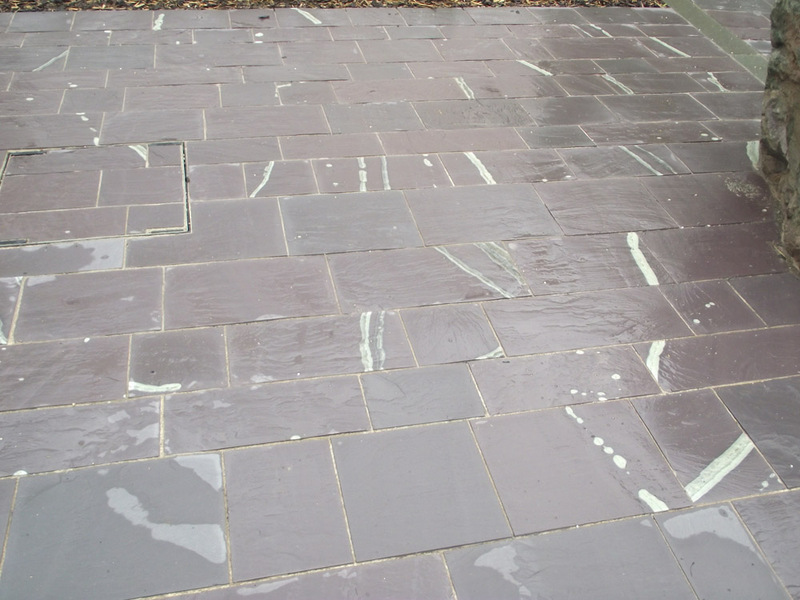 Frost resistance is a major consideration in the British climate, given that paving materials may be subject to repeated freeze-thaw cycles often when wet. This is the most severe test of a stone, one which is not currently satisfied by the European standard testing protocols. There are many examples in Britain’s streets of imported sandstones that are failing catastrophically after just three or four years. Passing the frost test is no substitute for experience. We are simply fortunate that many of the British sandstones have proved their durability over tens or even hundreds of years. 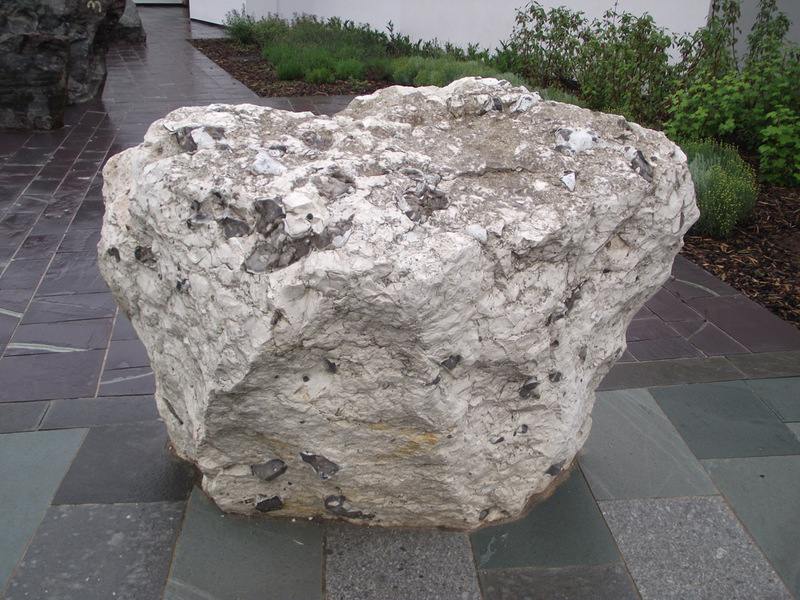 Limestones in general should be assumed to fail under freeze-thaw conditions so should not be used externally unless there is sound evidence of the stone’s capabilities. Purbeck stone from a number of the many worked beds has proved its worth as paving - quite surprisingly so. Blue Lias, likewise, has successfuly served as paving, but only relatively small quantities of this stone can be supplied. 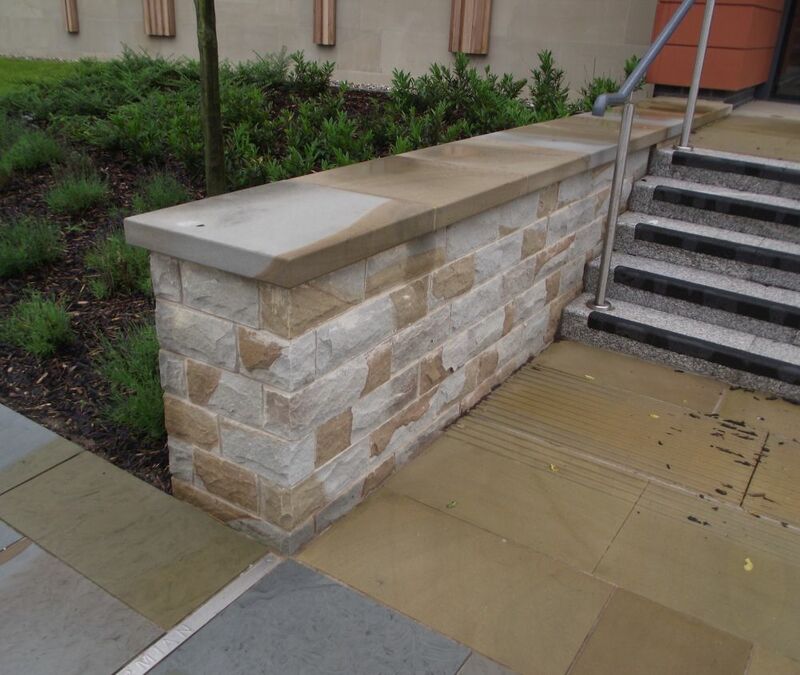 We have less experience of Baycliff limestone, but there are good reasons to believe that it will be competent for external use. 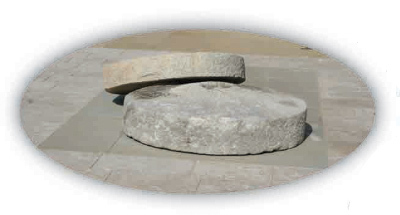 Some rock types can be worked in such a way as to yield large unfractured blocks and, from these, large slabs - typically 600mm wide, can be efficiently produced. 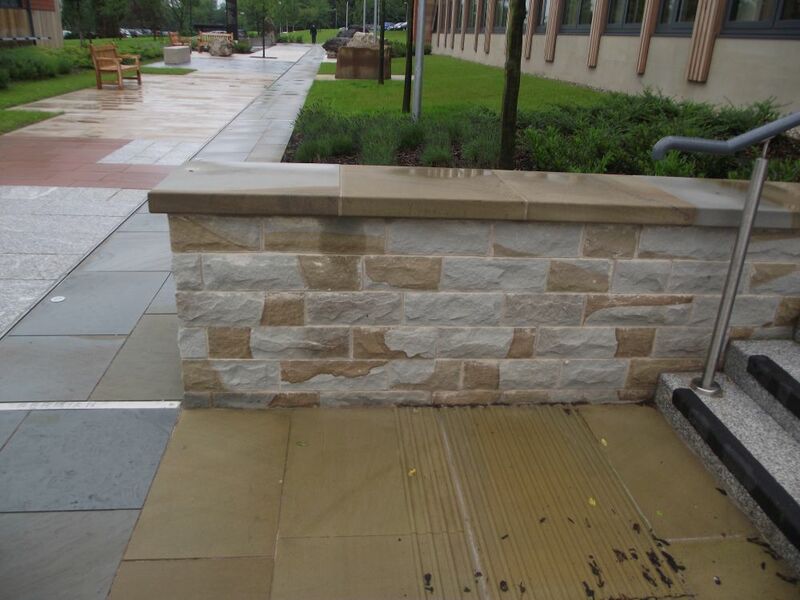 Some stone types naturally form smaller blocks so the optimum size is smaller. 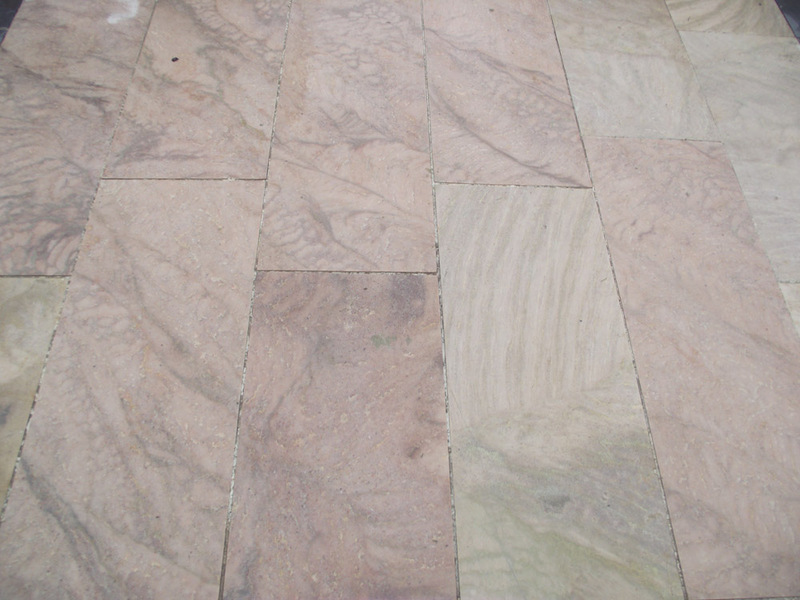 The paving stones with natural surfaces are usually (but not always – e.g. Caithness) best supplied in smaller dimensions. 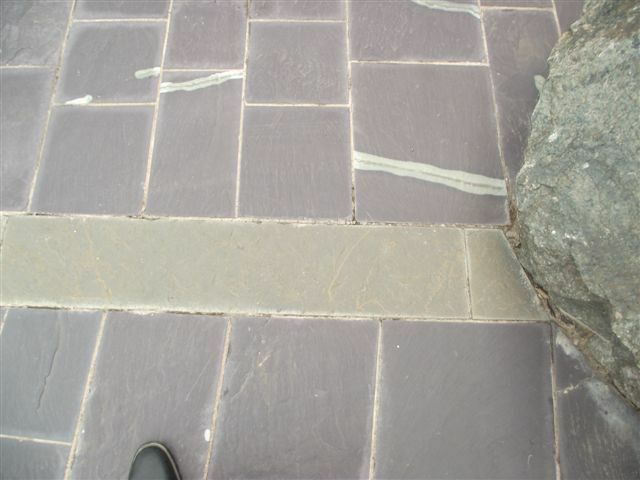 The thickness of paving to be used depends on the usage, the strength of the stone and also on the support that the paving will receive from beneath. 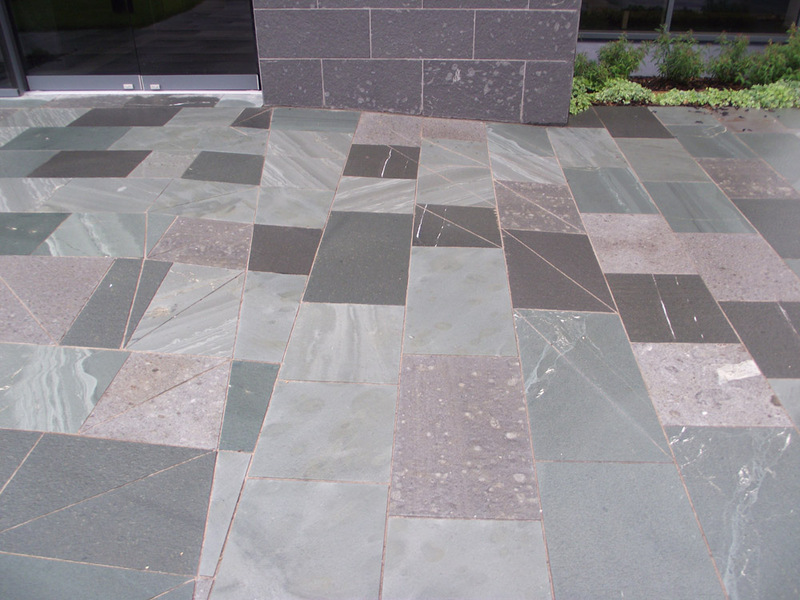 The thicknesses of the stone slabs used for the Geological Walk take into consideration the fact that a full mortar bed lies beneath the paved areas. 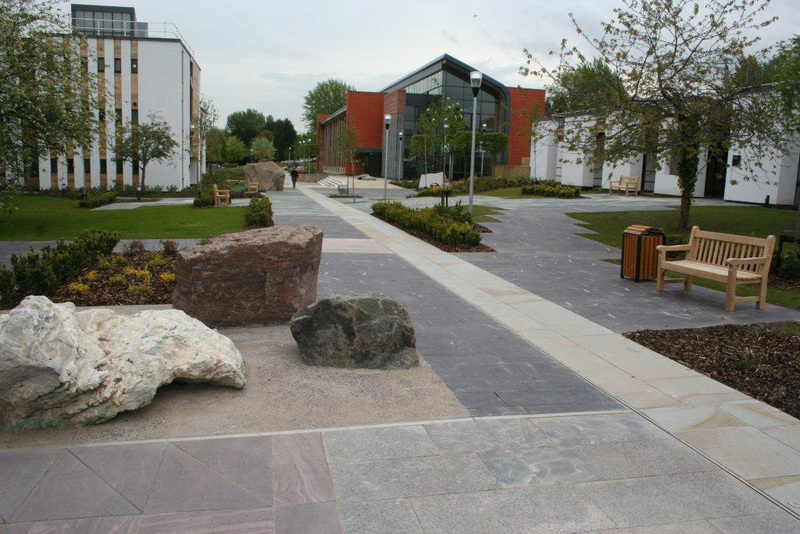 All these factors were given careful thought before a decision was made on the sizes of the paving slabs for the BGS geological path. The first ‘governing rule’ was that the plan dimensions should be those which the quarry could produce most efficiently; the thickness was then dictated (1) by the minimum required for performance and (2) by what could be most readily produced. 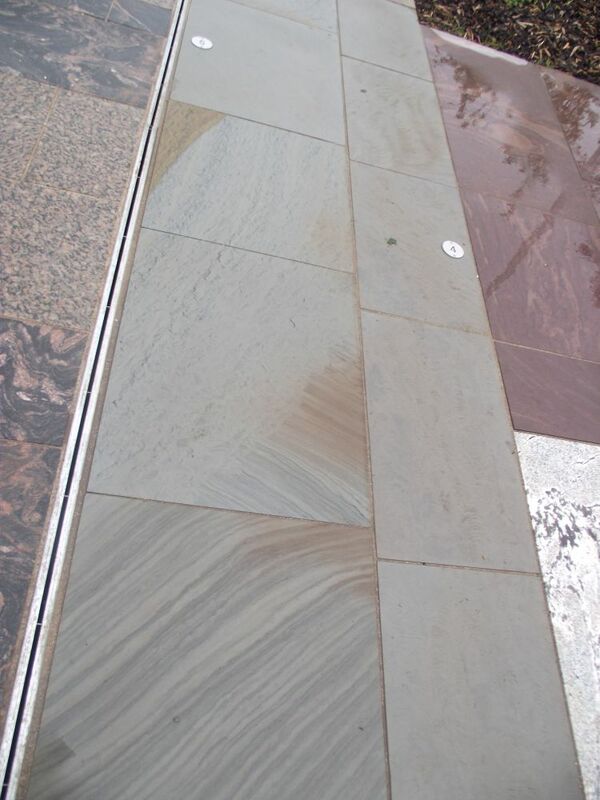 All the paving flags have been made with fixed widths and random lengths, generally within the range of the width of the flag to twice the width, which optimises the use of the raw material. It is also a most attractive format, though you will notice that care has been taken throughout to avoid joints in adjoining rows being too close to one another. 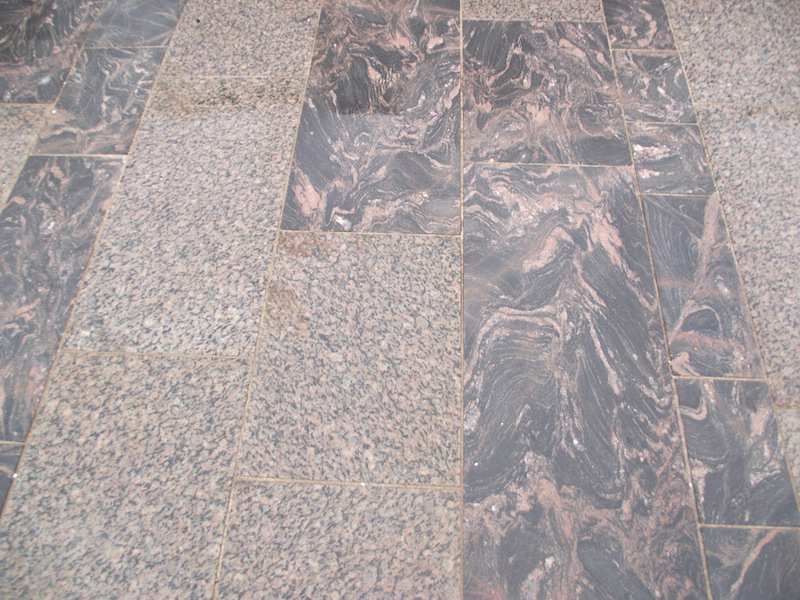 The sizes of the paving materials incorporated in this path may be specified with confidence to represent the most efficient production size for the quarry concerned, using the minimum of raw material to achieve the finished product (and also using the least energy). The useful consequence of this is keeping the cost to a minimum. If, however, you are unfamiliar with the material, do ask about the options, tell us the conditions in which it will be used and we will check the availability of the raw material for the quantity needed. For all of these items, materials from the relevant geological period have been chosen to meet the requirements of the design. Modern research indicates that Cornish granite should be placed just inside the Permian period, but since the granite intrusions of Cornwall have previously been considered to be in part Carboniferous in age (and may so be again in the future), the Cornish granite steps were left where originally designed. 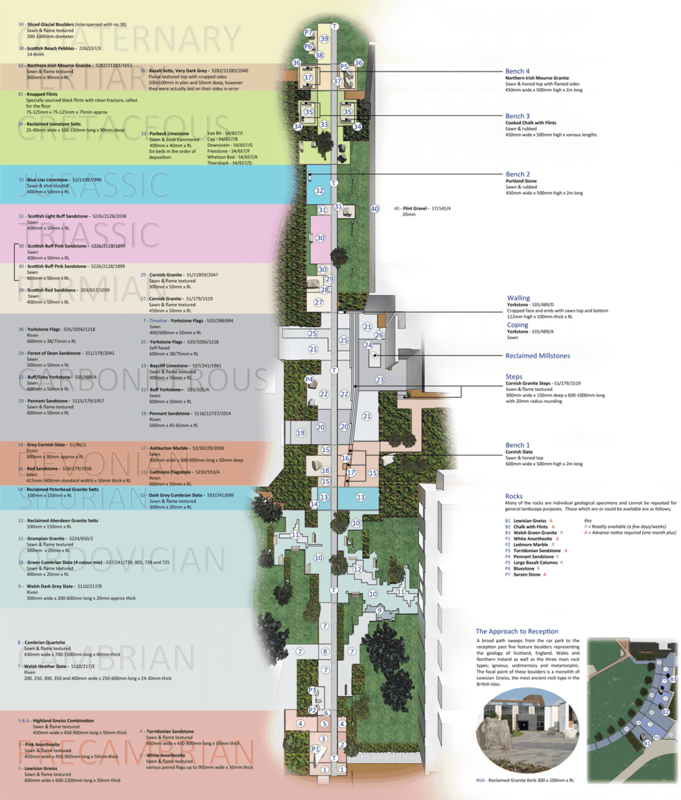 Please use this map as a specification guide for all the materials on display. Please click on the key to view an image of that material and its details.